To call this episode of Saved a feel-good show is a little like calling Schindler’s List a feel-good movie—yes, something good happens at the end, but you’re too shaken by everything that goes on before it to really feel good. Saved is a a slick, documentary-style series that follows the stories of two families and how animals helped them survive tragedy. This week’s episode of Saved is, as it seems everything is this week, Sept. 11-related. Kate Woolverton was four years old and located just a few blocks away from the World Trade Center when she and her nanny had to escape as the towers began to collapse. The show sets us up to think that, possibly, young Kate was killed, but she survived, albeit with significant stress trauma. Kate’s parents, unsure of how to help their shaken daughter, purchase a puppy named Scout for her, and Kate recovers as she takes care of her new charge. The Haskell family, meanwhile, was made up of New York City firefighters, three of whom were called to the World Trade Center on Sept. 11, 2001—but only one of whom returned. 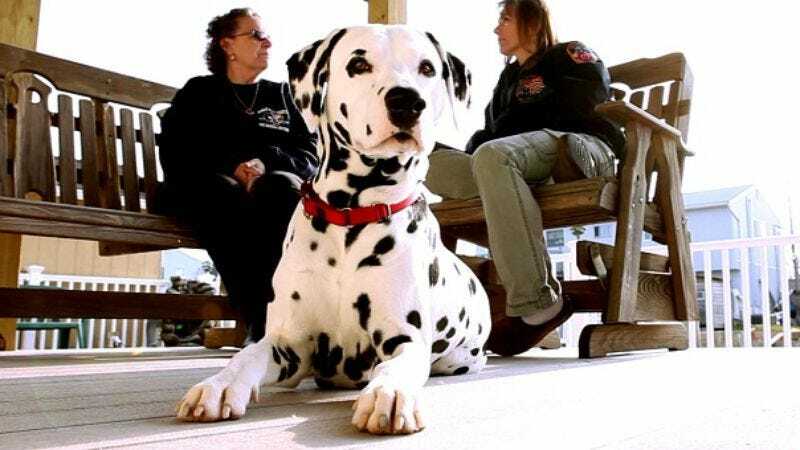 Timmy, one of the brothers who died in the buildings’ collapse, had gotten a pet Dalmatian named Blaze after his father died, and the surviving family members later took comfort in Blaze’s presence. As a dog lover, I expected Saved to give me a bigger dose of the warm-and-fuzzies than it did. Make no mistake about it, I got choked up several times throughout the show (especially after Blaze was put to sleep and Timmy’s sister talks about the dog frolicking with the Haskell brothers in heaven.) But the show spends so much time building up the events of Sept. 11 (the saturated colors and constant quick-cuts, often to stock B-roll footage, may prove disconcerting to some viewers) that the sense of sick dread that we all know so well that’s established in the first part of the show is not exactly mediated in the second half, when we learn about how Blaze and Scout helped their families cope with the traumatic events in their lives. Perhaps future episodes will have a slightly different tone, but tonight’s Saved is more of a Sept. 11 story than a dog tale, and potential viewers probably have varying degrees of willingness to delve back into the events of that day. In terms of serving as a portrait of how two families’ lives were impacted by Sept. 11, Saved is respectful and effective, but tender-hearted animal lovers may want to wait for a less-timely and identifiable episode. One of the wonderful things about dogs, as Kate Woolverton says, is that they don’t ask questions and they can help soak up their owners’ emotional pain—but that’s also a serious load to place on a fuzzy little head.